Soft Pastels are a dreamy medium, and lovely for people just getting started learning to paint. Ann will bring 80 stick kits and get you started on a new addiction. Pastels are a gorgeous way to learn color harmony and immediacy in painting. Pastels are instantly rewarding for new painters! But wait, you ask, “Aren’t pastels a drawing material?” They can be, but not the way I use and teach them. For me, pastels are pre-mixed brush loads of vibrant paint. Most beginning painting students struggle with mixing clean colors. Soft Pastels bypass that struggle and get you right into the process. 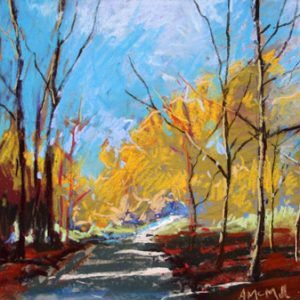 Instructor: Ann McMillan: Ann’s artistic career has been an adventure in many styles of painting. She began with science and botanical illustration, followed by an exploration of portraiture and figure painting, and then pursued plein air landscape painting. Ann’s teaching focuses on skill-building in drawing and painting. Ann teaches at the Palo Alto Art Center. Offered: 6 Fridays, beginning: October 6, 9:30 to 12:00.